If you're still busy shoveling Dragon Quest VII: Fragments of the Forgotten Past into your body, you might want to hurry things up a bit. Dragon Quest VIII: Journey of the Cursed King is coming to the Nintendo 3DS on January 20, 2017. Dragon Quest VIII isn't quite as hefty as its predecessor (which is easily capable of stealing away at least 100 hours of your life, even though the Nintendo 3DS remake of Dragon Quest VII streamlines the original PlayStation experience), but it's no brisk 20-hour game, either. In fact, the Nintendo 3DS iteration of Dragon Quest VIII adds new playable characters, new story content, and new challenges. It may be exactly what you need to get you through the frigid white desert that is January's game release schedule. Just add hot chocolate and a favorite blanket, and you're good to go for a long time. Unlike Dragon Quest VII, Dragon Quest VIII 3DS hasn't received a complete graphical overhaul. Though I was only able to peek at the game through a video preview hosted by Nintendo, what I saw closely reflects the original release for the PlayStation 2. Incidentally, Dragon Quest VIII's sprawling open world is over 11 years old – it first came into being in 2004 – but watching it all unfurl before you is still pretty exciting, especially since Dragon Quest VIII 3DS gets rid of random encounters. While it's nice to not have to deal with pop-up battles, make sure you still ride a Great Sabrecat every so often. Dragon Quest VIII 3DS adds two new species: A black Sabrecat and a white one. Both can be summoned with expendable bell items. They're merely palette-swaps of the original Sabrecat, but if you choose to say "No" to a melanistic variant of the Dragon Quest series' coolest mount, there is no helping you and you should think very hard about your life's choices. 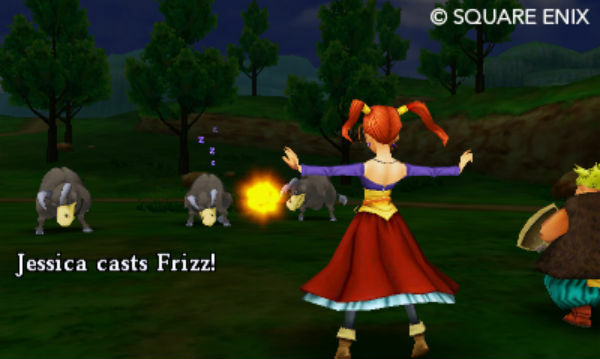 Dragon Quest VIII 3DS also turns two of the first release's NPCs into major characters. Red and Morrie are playable as a Thief and Fighter build, respectively. Red's weapon of choice is a couple of razor-sharp fans, whereas Morrie prefers claws. Morrie's skillset is well-suited for slaying metal monsters, so hooray for easy experience farming. Red has a bit of the Dancer build in her blood, and therefore has an innate means of restoring characters' health and life. Both Red and Morrie have supplemental story and dialogue attached to them. Early on, Dragon Quest VIII 3DS introduces you to Cameron, a camera enthusiast who offers rewards for snapping pictures of special monsters. The name "Cameron" should be a tip-off that puns are alive and well in the world of Dragon Quest VIII 3DS. In fact, Dragon Quest VIII closes a circle: The original PlayStation 2 release introduced the very British localization style that's been part of every Dragon Quest translation (and re-translation) since. And according to Nintendo, Dragon Quest VIII 3DS more or less uses the same translation as the first release of Dragon Quest VIII, albeit with additional dialogue coupled with the 3DS game's new content. But we can't talk about what's been added to Dragon Quest VIII 3DS without mentioning what's been taken away: The orchestrated music. Japan has it, but the West does not. However, voice acting was a quintessential part of Dragon Quest VIII's localization, whereas the Japanese release lacks it on both the PlayStation 2 and the Nintendo 3DS. 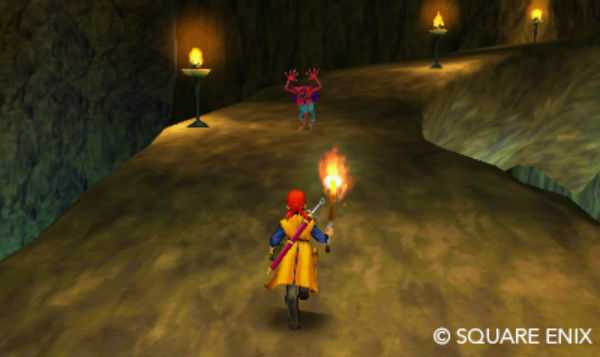 Nintendo had to make a choice for Dragon Quest VIII 3DS's localization: Ditch the voices in favour of the orchestrated soundtrack, or downgrade to a MIDI soundtrack and keep the voices. It's a tough choice, but I'm personally pro-voices. After all these years, I can't imagine untangling Yangus' cockney accent from Dragon Quest VIII. Besides, Dragon Quest VIII 3DS offers new characters, a new murderous X-Rank for the Monster Arena (if you dare! ), a new story-related dungeon, a new challenge dungeon, new outfits for the characters, a streamlined alchemy system, and the aforementioned camera challenge. Losing the orchestrated soundtrack is a bummer, but then I just think of jet-black Sabrecats with purple mohawks, and I smile. Look for Dragon Quest VIII: Journey of the Cursed King on Nintendo 3DS on January 20, 2017. Tagged with Nintendo 3DS,	Previews,	Role Playing Games,	Square Enix.